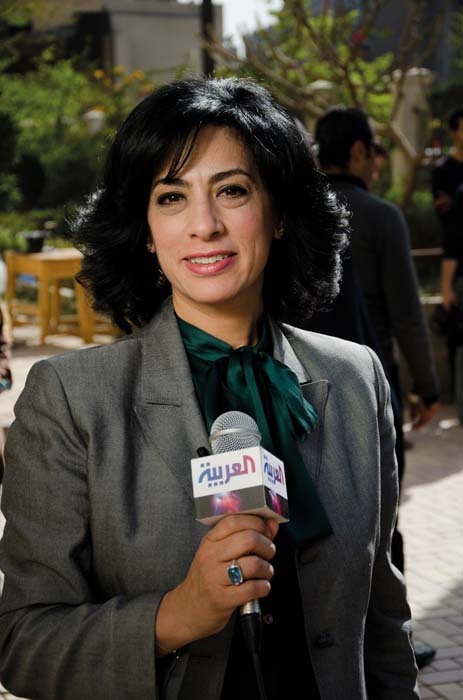 For Randa Abul-Azm '91, Al Arabiya channel's Cairo bureau chief, January 25 did not merely mark the onset of the revolution, but it also initiated a new a phase in her career. "I'm proud of Al Arabiya being ranked as number one, capturing 65 percent of viewers. People would change the channel immediately if they didn't think you were credible," she said. Abul-Azm established a career in media in 1995. Upon the launch of Al Arabiya in 2003, Abul-Azm was appointed bureau chief of the channel's offices in Cairo. Throughout her career, Abul-Azm affirms that maintaining credibility has always been a top priority. "I never announce information unless I am 100 percent sure," she said. During the Egyptian uprising, Abul-Azm was at the forefront of events, and her name became associated with exclusive breaking news. Just before Mubarak's address on February 10, Abul-Azm was the first correspondent to reveal that the former president will not be stepping down. She was also credited for reporting on statements from the Supreme Council of Egyptian Armed Forces even before they were communicated on air. One of Abul-Azm's biggest accomplishments during the revolution was her interview with Ahmed Ezz, steel industry tycoon and former chairman of the Planning and Budget Committee in the Egyptian People's Assembly. "He was one of the most controversial figures in the regime," said Abul-Azm. "I had never interviewed him or established personal contact with him before. When the revolution started, people wanted to see this man and wondered if he felt any guilt. It was very intense and nerve-wracking. He had his opportunity to admit his shortcomings, but he didn't. I don't think public opinion changed much." With the country facing a nationwide telecommunications blackout, Abul-Azm found it difficult to remain connected, but the scarcity of communication means wasn't her only challenge. "It was hectic and very difficult, not only in terms of getting news and information, but also the amount of pressure was unbelievable," she said. "After the camel incident, our office was shut for three days, and our correspondents were assaulted. I didn't see my family for three weeks. I was constantly in a state of hiding because I was subjected to the threat of being attacked or detained." When asked if she believed that the media played a role in shaping Egyptian history, Abul-Azm said she believed the news dictated the direction of the media and not the reverse. "Media coverage played a highly signficant role, and especially new media because it helped us catch up on any coverage that has been missed," she explained. "Perspective varied in each television station. There didn't seem to be a homogenous pattern within privately owned channels; some were daring, others were not. One of the major defects in local media is that anchors tend to act like analysts. Maintaining balance in showing both sides of the story is critical. In fact, it strongly factors into how successful you become."